Rollators are an ideal solution for people who suffer from a long term disability, loss of confidence, stamina or strength. 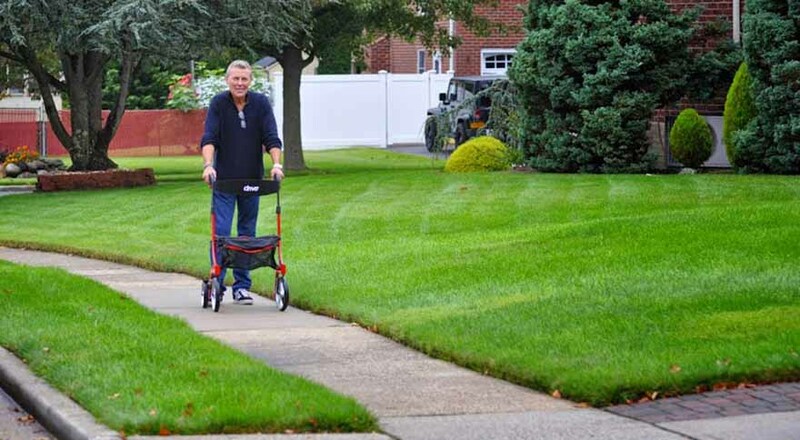 Rollators are a great way of increasing your mobility and giving you the support that you need while you are walking and also provide you with the safety of a security of seat for times when you are feeling tired and may need a rest. They are also a great replacement for a walking stick as a Rollator will provide support to both your arms. 1. Do you use a crutch or a walking stick as well? – You may need a Rollator that has a built in crutch/stick holder. 2. What weight is the Rollator? – A walker can be made from steel or aluminium. A walker made of steel will be heavier ideal for people who need more grounding; however, a heavier walker is not always ideal for everyone. The lightweight aluminium Rollators are more popular due to the ease of manoeuvrability. 4. Will you need a seat on your Rollator? A Rollator with a seat may be the ideal solution for you if you find you get tired while walking, however seating on a Rollator is only recommended for short periods of time. If you find you are looking for seating for longer periods a wheelchair may be more suitable for your needs. 5. Will you need a storage compartment for your shopping or bag? Again some Rollators come equipped with a bag or a basket which will hold your personal items for you so you will not be put off balance with a bag hanging on one side of the Rollator. 6. What braking mechanism will suit your needs? The most common braking system are pull up levers however if you suffer from arthritis or limited hand movement you may require a Rollator with push down brakes. 7. What Rollator height will you need? Rollators vary in height, so if you are a tall person you will to make sure you are choosing a walker which is the correct height for you as you will not want to be stopping over. Also if you are a shorter person you will not have the correct support or control over the Rollator if it is too high for you. 8. Will you need to transport your Rollator in a vehicle? Some Rollators will fold up so you can transport it easily in the boot of your car. There are Rollators which will not fold and consequently will be too big to fit in your boot depending on the size of it. Whatever Rollator you choose to buy we would recommend you pay a visit to our showroom where we can offer you an assessment free of charge and be sure the Walker/Rollator is right for you.